At the risk of coming off as, well, daft, I would argue that not only should Daredevil be no better equipped than anyone else to figure out the nature of Spider-Man’s change of character. If he actually were able to do it the way the proponents of this theory suggest, his ability to identify people generally would really be much worse than it is. Part of what makes Matt’s ability to recognize people through his senses of hearing (heartbeats, voices, breathsounds) and smell is that it is, to a great extent, immune to most attempts to conceal these features. He can recognize someone through a layer of perfume or cigarette smoke and he can identify a person’s heartbeat whether they just got out of bed in the morning or came straight from running a marathon. He doesn’t recognize people by how fast their heart is pumping (his lie-detecting abilities, on the other hand, are tied to the actual speed and pattern of the beating heart), but by the unique “voice” of the heart as it is molded by that particular person’s physiology. Even though Doc Ock’s consciousness is in Peter Parker’s body, the body will not automatically change in response to being inhabited by a new personality (though it’s conceivable that whatever new habits this personality brings with it might lead to gradual changes over time). The “voice” of Peter’s heart should be the same, even underneath a potentially uncharacteristic hyped-up-on-adrenalin frequency pattern. By the same token, the vocal chords of Peter Parker’s body will remain the same. The speech pattern will be different with Doc Ock at the helm, but Matt is more likely to think: “Why is Spider-Man trying to do a Doc Ock impersonation?” than “Ah, Doc Ock has taken over Spider-Man’s body!” If it were easy for people to override the paramaters set by the physical body, in terms of voice quality, body sounds and body chemistry, fooling Daredevil’s senses would be much easier as well. The most relevant real-world comparison to the Doc Ock situation is probably Dissociative Identity Disorder (also known as Multiple Personality Disorder). While DID remains controversial to this day, it has been suggested by some that each personality may represent a discrete physiological state. However, even in that kind of scenario – and the available evidence is inconclusive – we’re likely talking about the kind of differences that come from different emotional states (where personality A may be fearful and defensive and personality B an adrenalin-driven adventure junkie). At the end of the day, the so-called alters are still inhabiting the same body. Since the Daredevil #22 preview is unlettered – though we can probably expect a lettered version on Friday – there’s no way of knowing whether Mark Waid has decided for Daredevil to start suspecting a body switch/demon possession scenario (hey, it is the Marvel Universe and there was that Shadowland situation…), but this should be for reasons obvious to everyone who knows Spider-Man: The guy looks/smells/sounds like Spidey, but he’s acting out of character. One way you could have Daredevil’s senses play a major role in deciphering the truth is if he were to catch the good doctor in a lie. Other than that, his new body should give very little away that wouldn’t also be clear to other people through changes in body language, mannerisms and behavior. Je parle français? Mais oui! Great days ahead for Daredevil fans! I’d never disagree with you. You’re a genius. Only Batman would know straight away. 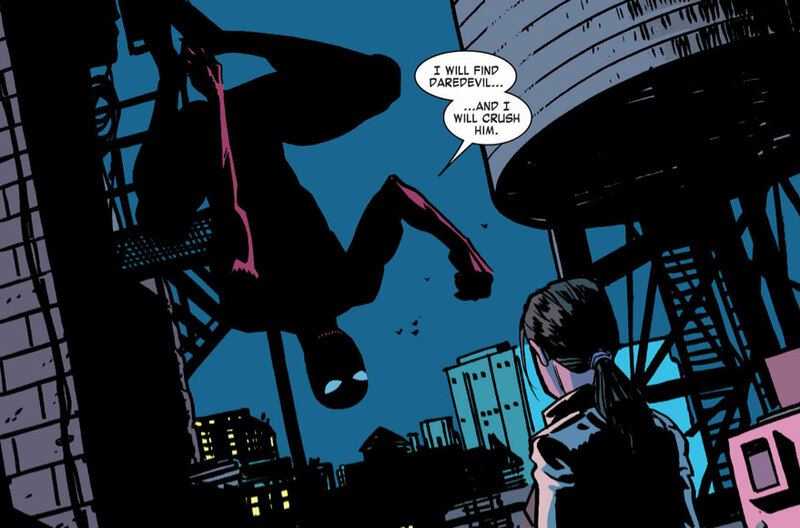 To play, er, Devil’s advocate: might Doc Ock’s consciousness in Peter Parker’s body force a near-constant state of lying, which Daredevil would detect as such? At the very least, would he not have to lie to pretend to have hung out with Daredevil on many occasions? I admit that I don’t know the details of the transformation into Superior Spider-Man. This may all be dealt with in the final issues of Amazing Spider-Man. As for the general conversation, the Multiple Personality Disorder comparison is intriguing. Haven’t there been situations in real life where the same person had a completely different accent (sometimes whole language) depending on which personality is in play? Wouldn’t it be possible that the brain would trigger different hormones based on the different personality as well? That would make him smell different. (Not to mention that they probably have a different diet, thus the change over time you mentioned.) Wasn’t that why he didn’t recognize Mary and Typhoid Mary as the same person? Or was it just her pheromone power that made men fall in love with her that was to blame? I’m with you, Christine. If it’s Peter’s body, much of the physiology would be the same (unless, as Elizabeth pointed out, a dietary change altered it). Of course, I’m betting Doc Ock isn’t nearly as good at banter as Peter, and Matt’s lie-detector routine would easily expose the impostor if he thought to use it. The DID/MPD parallel is interesting, but based on my limited experience with the disorder (my adopted sibling was diagnosed with it, and later institutionalized as a result), I don’t think it would create enough of a physiological change to tip Matt off. People who knew my sibling could spot the personality shift when it happened, but it had more to do with facial expression and bearing–things that are hard to get a bead on when Spider-Man’s flipping all over the landscape, and hard to pick out when Spidey already does so many impressions. There was no major vocal shift when my sibling made the change, although the vocabulary changed a little. I think physiologically your arguments make sense, but this is a unique situation. We really don’t know if brain swapping can create a detectable change in someone’s physiology. Doc Ock may be naturally more anxious or something else down that line of thought. As you said Matt may also be able to detect a difference in terms of body language, mannerisms, and behavior. However, I think those things will scream at him in way they would not to someone who doesn’t have Matt’s power set, not to mention his longtime friendship with Spider-Man. We make fun of the aura thing, but I think it’s reasonable that Matt know something is just off. By the way the panel you posted from DD #21 threw me when I first saw it. I just thought it was Peter being funny (I was unaware of the “shift”). I can see them going this way, though. It’s not like comics always make sense when it comes to science-y things. Well, the lettered preview for Daredevil #22 is up, and it looks like Mark Waid is onboard with the same kind of reasoning I presented here. Love it. “That can’t be Spider-Man–he’s shutting up too much!” That is EXACTLY the right reaction.